As temperatures begin to warm up at outdoor worksites across California, Cal/OSHA reminds employers to protect outdoor workers from heat illness. On April 12, Cal/OSHA will participate in a news conference and bilingual training sessions to help employers plan for and prevent heat-related illness and death from affecting outdoor workers. On April 16, Cal/OSHA will host a Heat Illness Prevention Network conference call to review best practices and allow for questions and answers. Cal/OSHA investigates heat-related incidents and complaints of hazards at outdoor worksites in industries such as agriculture, landscaping, and construction. The most frequently cited heat-related violation is for failure to have an effective written heat illness prevention plan specific to the worksite. Serious heat-related violations are often related to inadequate access to water and shade, and to a lack of supervisor and employee training. Additional information about heat illness prevention, including details on upcoming training sessions throughout the state are posted on Cal/OSHA’s Heat Illness Prevention page. Cal/OSHA also has extensive multilingual materials for employers, workers, and trainers on its “Water. Rest. Shade.” public awareness campaign website. 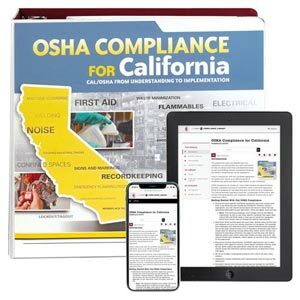 J. J. Keller's OSHA Compliance for California Manual provides guidance to help comply with Cal/OSHA's most scrutinized regulations.